Your Choice for Great Entertainment! 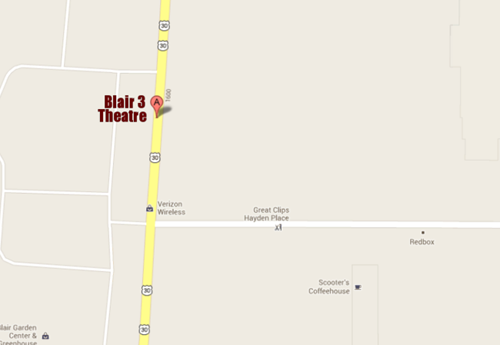 Blair 3 Theatre is a two-screen theatre dedicated to providing first-run movies to our community. Join your family, friends, and neighbors and catch a current movie or start a special interest club close to home! #2 auditorium holds 182 seats and houses new digital projection & sound equipment. #3 auditorium has been converted to a party / meeting room for private rentals by family, friends, work groups, clubs, classes, and interest groups. Copyright © 2019 Blair 3 Theatre, Inc.